Sew what's cooking with Joan! 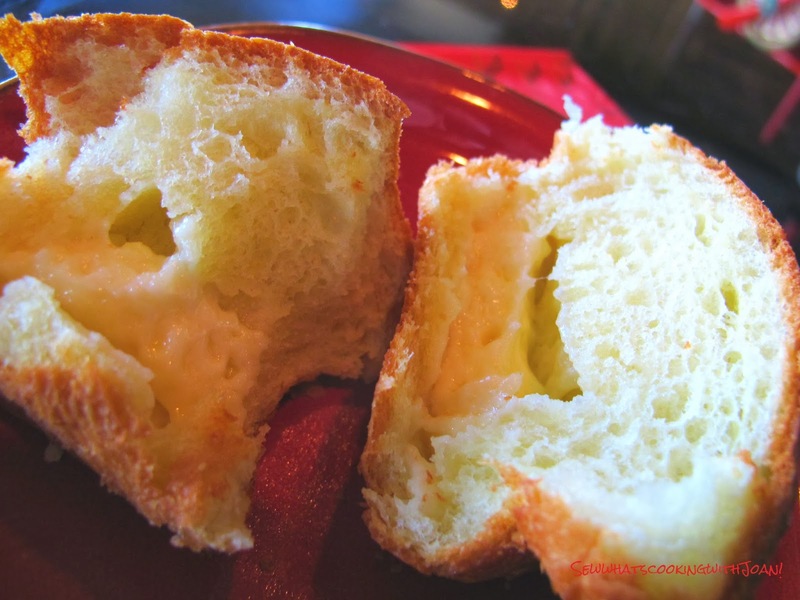 : Brie filled Brioche! Perfect for the holidays! Brioche may be one of my very favorite breads. 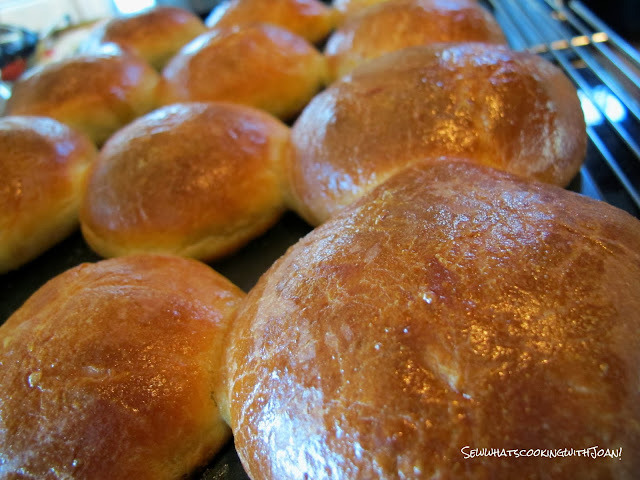 Whether I bake or eat it, there is so much pleasure associated to a homemade brioche. Think about the immense happiness that arises from biting into the sweet, soft, airy bread which, after one roll, invites you to a second one. For me, however, it starts with the smell, the yeast which ferments and diffuses its wonderful aroma in the whole house. As a kid, whenever my Mom used to bake a bread or yeast pancakes, I would hang out in the house, never going too far! Then I would sneak in to smell it, every now and then, lifting the towel covering the dough discreetly so as to check the puffiness of the dough. It was pretty fascinating actually. I love the Brioche Hamburger buns of late, aren't they good? Have you had one? It is heads and tails above the normal hamburger bun. When we go for a burger, I ask if it is on a Brioche roll, if not....chances are, I'm not ordering the burger. Brioche is such a rich dough to begin with, the idea of inserting a buttery brie just seemed a little over the top. Sometimes though over the top can be very good and this looked to me like it might just be one of those times! So, today I am offering a little twist on Brioche, I put a little cube of Brie cheese in the center. Yum!! These are so delicious. 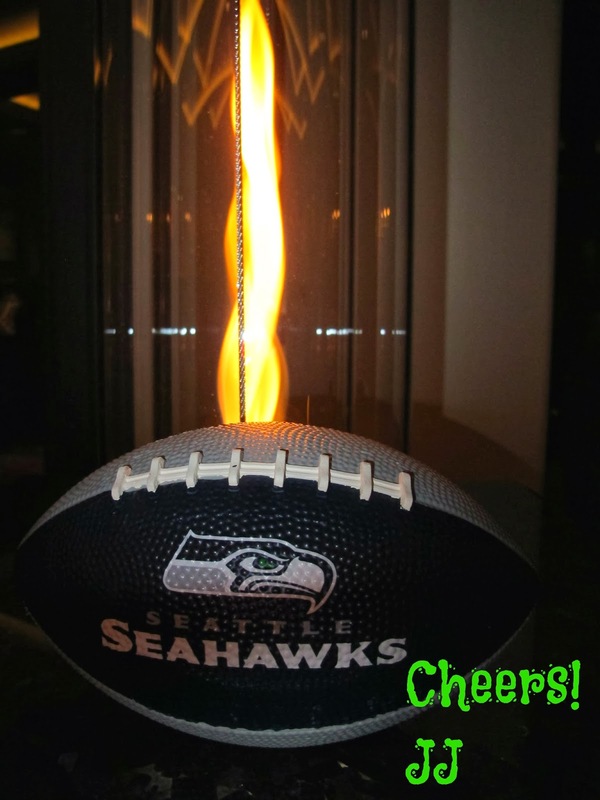 And were a hit at a party I gave recently. 1 package dry yeast or 1 1/2 tsp. Pour 1/3 cup warm water into large bowl with paddle attachment. Sprinkle yeast and let stand for 10 minutes or until the yeast dissolves and mixture looks bubbly. Meanwhile, whisk 2 cups flour with 3 tablespoons sugar in a medium bowl. Add to the yeast mixture, using the paddle attachment (mixture will be dry and crumbly) Now add eggs, one at a time, beating for 30 seconds on medium speed, between each addition, then beat for 10 minutes. Mixture will begin to mass around paddle, keep beating. Add butter 1 tablespoon at a time, incorporating before adding more, a bout 7 minutes, then beat about 4-5 minutes longer. Dough will be shiny and sticky. Turn dough out onto a genorously floured board. Knead no more than a few tablespoons of flour into the dough. Butter a large bowl, put the dough in, flip to coat with butter. Cover bowl with palstic wrap, then, a cloth. Let it rise in a draft free place for almost 1 hour and 15 minutes. Punch down and cover again. At thi8s point you can refrigerate over night. Or, allow to rise again for 1 hour and 15 minutes. Butter 12 standard 1/3 cup muffin tins. Cut dough into 12 portions, roll into a ball and insert a 1 inch cube of brie. Place into the prepared muffin pan, cover loosely with plastic wrap and towel and allow to rise one more time for 1 hour and 15 minutes, until muffins are extending slightly over edge of tin. Meanwhile position rack in center of oven. 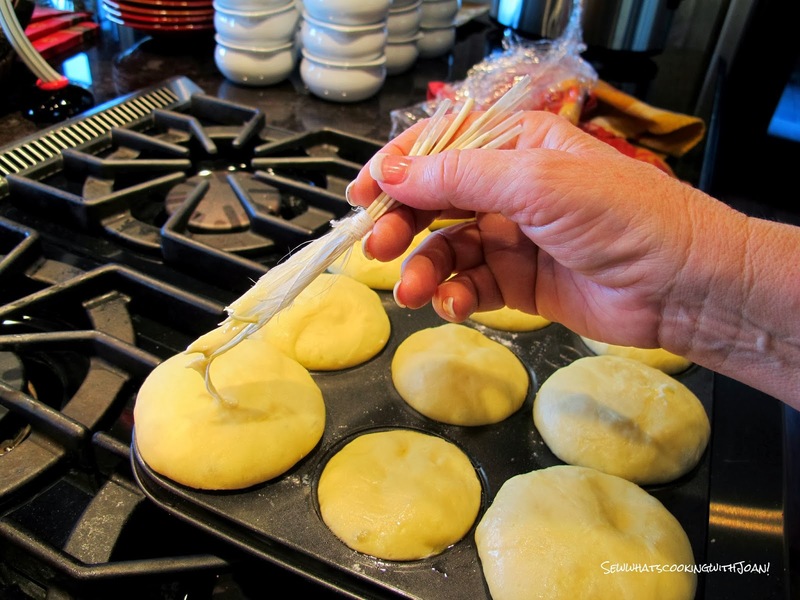 Preheat oven to 375 F. It is important that the oven be fully heated, so that the brioche cooks evenly. Beat together the egg and cream, brush the tops of the brioche with the egg mixture. Bake rolls until deep golden brown on top about 15 minutes, transfer to rack and cool for a few minutes, run a sharp knife around each roll and turn out onto rack. 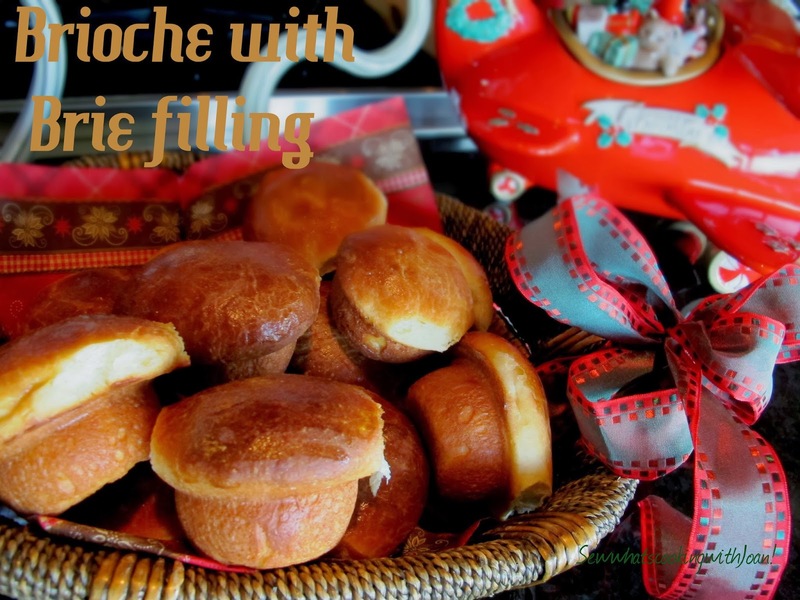 These disappeared so fast and everyone at my party was over the moon about these delicious Brioche rolls with a creamy Brie surprise in the center. I loved the brie center, but, think of the possibilities. you could pop a little chocolate or fruit jam in the center...yum!! I served my rolls along side Rosemary Chicken Chowder and a yummy Kale and black eyed pea salad (figure friendly series in January 2014). Can be made up to 8 hours in advance. Store them in a airtight container. 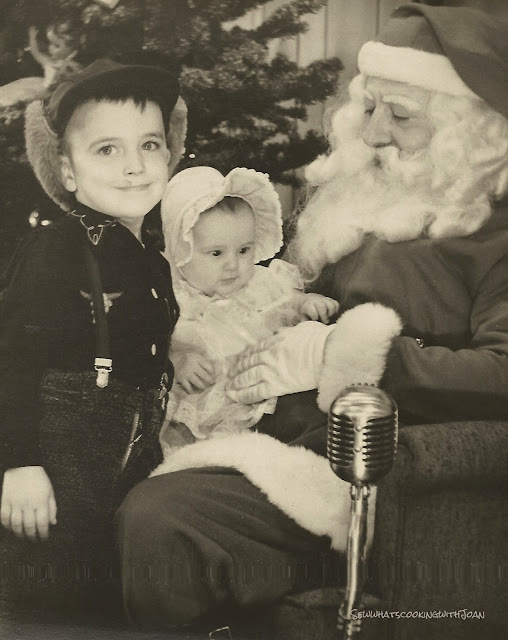 My brother and I with Santa 1952!! Taken at Frederick and Nelson in Seattle.